Boy, have we had some rain this summer in Alabama, and it has brought with it an infestation of ants. While ants aren’t exactly the germiest of insects, they are still gross to find in your home, especially in any quantity. We have always struggled with ants in our mailbox, but a few weeks ago they showed up in my kitchen. Ants can be extremely difficult because any little trace of food will draw them in. And try as we might, it’s just hard to keep every crumb of food off of kitchen counters. I could trace that these ants were coming from a light switch near my kitchen sink. I tried several different brands of ant sprays, and they all worked at the moment, but the ants always returned within a few hours or even minutes. I needed to bring in the big guns: I needed the best homemade ant killer I could find! After a little research, I came across a homemade ant killer using ingredients that I had on-hand, so I gave it a try. It worked like a charm! In fact, not only did the ants go away after several days, but they have not returned. This week has been a good test, as we have again had several stormy days in a row, but the ants are nowhere to be seen. Yea! 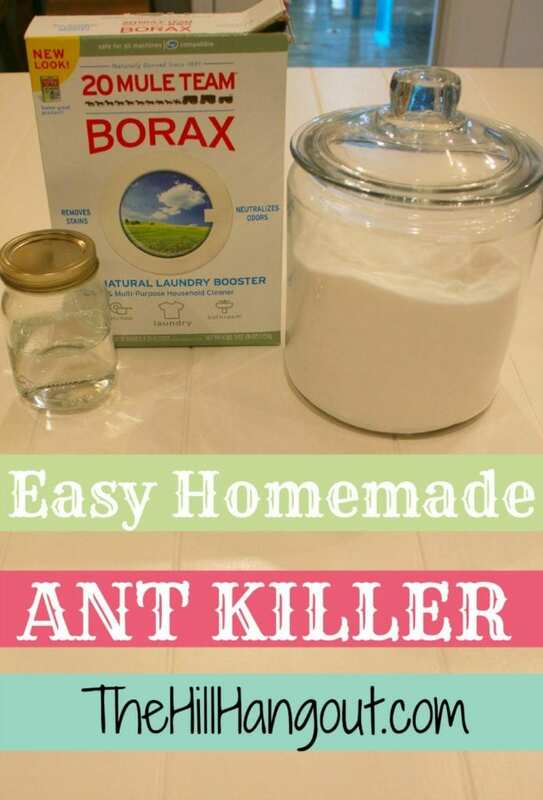 Borax is the key ingredient which will kill the ants. However, ants won’t be attracted to straight Borax, so mixing it with a little sugar will draw them in. The combination will not kill them upon contact (at least not all of them), and you want them to return to their nest in order to kill them at their source. I placed the ant killer on a small dish just below the light switch where they were coming in. Almost immediately, several ants were attracted to the dish. Some didn’t make it out alive, but a few carried the mixture back to the nest. The next morning there were MANY ants on the dish (so gross!). As the day wore on, I noticed the number of ants shrinking drastically. By nightfall they were almost completely gone. By the next morning, there wasn’t an ant to be found and they haven’t returned since. The last few days have brought more storms and perfect circumstances for the ants to return. Our ant killer is still holding strong, and the ants have not made a single appearance! Thanks, Michele! I will try the cinnamon in my mailbox. They love the cool darkness it provides and keep coming back. I haven’t tried the Borax solution there. Might just sprinkle some cinnamon in there and see what happens. Just enough water for the powder to dissolve. Maybe 1/2 cup or so.